We only had 3 nights in Slovenia. Hopefully we'll do some more one day, but at least we did the part called Gorenjska, as well as crossing the Triglav National Park on the Vršič pass. "If by some misfortune you were only allowed to visit one region of Slovenia, there is no doubt that Gorenjska would be a good choice." And, forget the guidebooks! This website has plenty of great information. So, at least we did the best part. 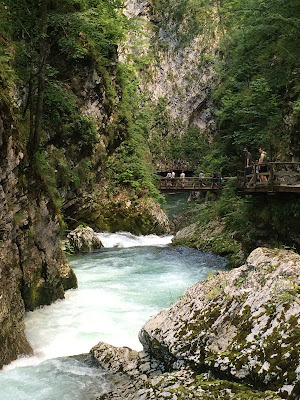 On our first night in Slovenia we tried to pamp on the pass going through Triglav National Park. Ourselves and a Spanish ice box (that's what we call the normal white motorhomes found commonly in Europe) were in a parking lot that didn't have any signs telling us we couldn't stay there (whereas other parking spaces did), but a man from National Parks came and told us we couldn't stay within the park. So, with a tremendous storm brewing, and not wanting to continue up through the bends in bad weather, we had to go back down to a campground. The storm struck as we were descending and when we arrived at the campground we couldn't even see more than a few meters in front of Blac. Crossing Triglav National Park on the Vrsic Pass. 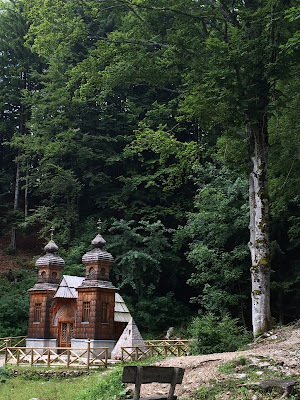 The next day we crossed the pass, stopping at a cute Russian chapel and a few viewpoints. The pass was built by Russian POW's and many died in an avalanche. 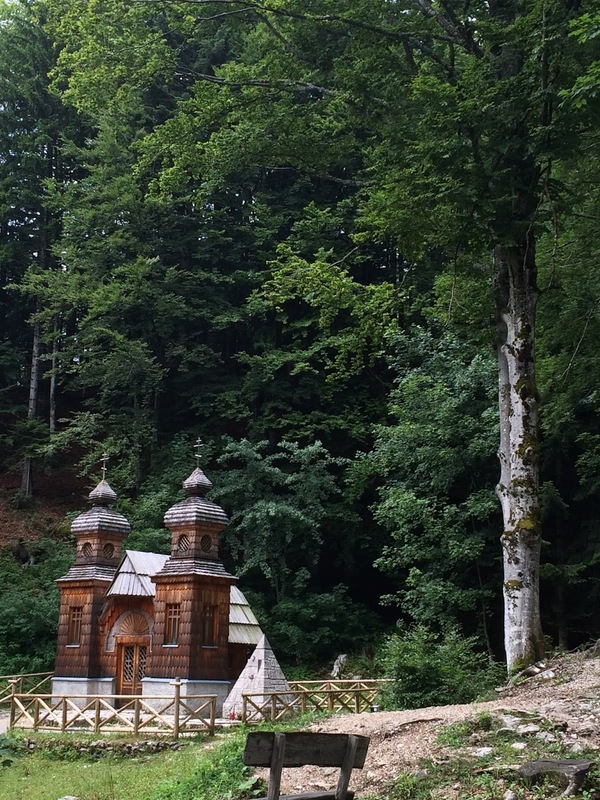 The cute Russian Chapel on the pass in Triglav National Park. Later that day we also did Vintgar gorge. It's a longer hike, but not so difficult and I've been capable of that type of walking for a couple of months. It's also extremely spectacular: a river rushes through the gorge and they've build a walking path along the sides so that it can be visited. Next, we visited another lake (Bohinj) and took a drive through some countryside to find a border crossing without using a motorway (for which you need a vignette, which aren't so cheap for us). 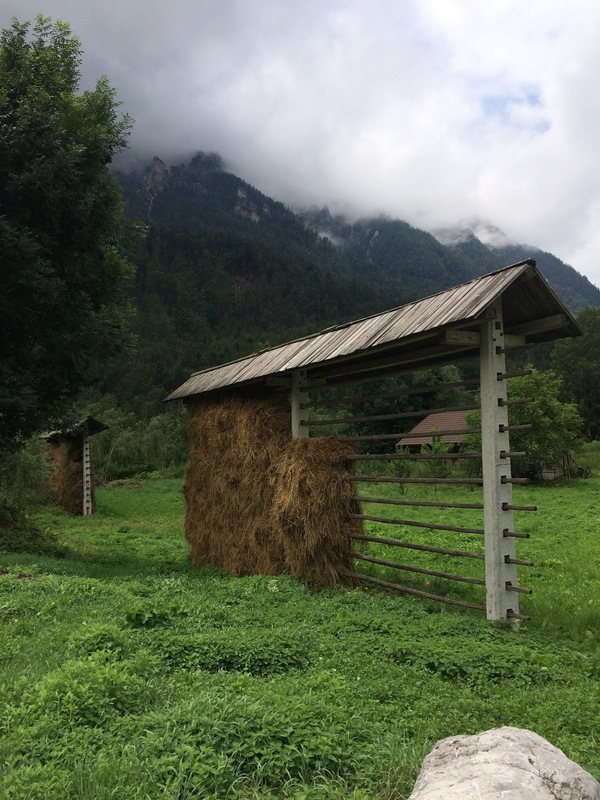 In the Slovenian countryside two agricultural systems got our attention as these were done differently to what we'd seen in other parts of Europe and the world. 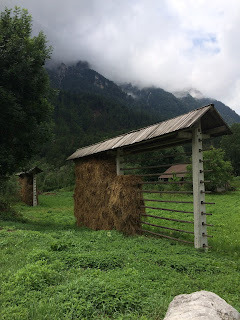 Firstly there were hay drying racks everywhere, with small rooftops. And also, the Beehives, like the one shown below, many of which had wheels under them for moving. Many that we saw were very colourful, although we didn't see any with artworks on them, although it was popular historically in Slovenia.